COURTNEY HAYDEN/Sun-Gazette Franco’s Lounge prepared their popular mixed greens and pine nut bruschetta, a savory appetizer. 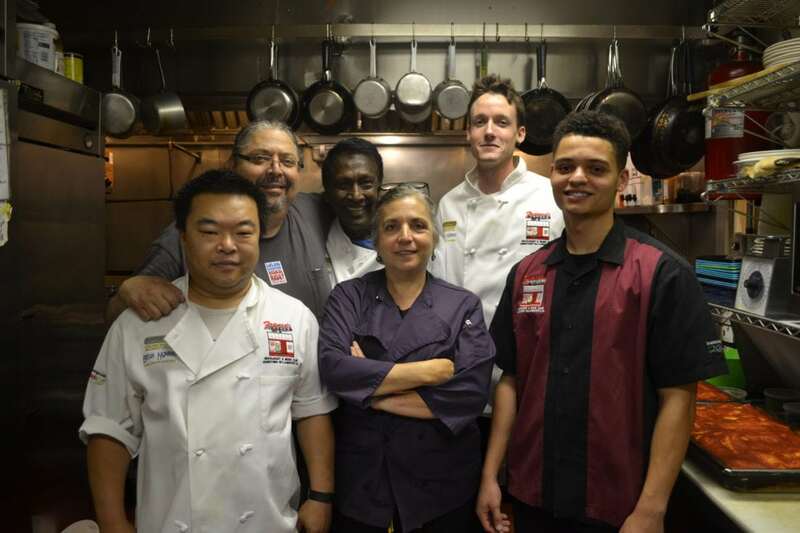 Pictured, above, are the chefs and staff at Franco’s Lounge with Mike Morgan (front row, left), Maria Daniele, Dante Wright, Alfredo “Fred” Daniele (back row, left), Chef Godfrey Tisseverasinghe and Aidan Gscheidle. With vibrant colors and savory flavors, one of Franco’s Lounge’s, 12 W. Fourth St., popular appetizers is the mixed greens and pine nut bruschetta, said Alfredo “Fred” Daniele. At Franco’s, the dish is served as a bruschetta but the sauteed mixture is versatile and can be used on top of a pasta dish or on a pizza if you don’t have bread, he said. The dish was designed to use up fresh greens by sauteing them, Daniele said. The dish, and the kitchen at Franco’s, is versatile, and can be made to one’s liking. At Franco’s, they like to add crushed red peppers to add spice, but the seasoning can be left off for those who don’t want a spicier food. The combination of sauteed greens, toasted pine nuts, mushrooms with garlic and seasoning creates a comforting dish, Daniele said. Heat a saute pan and get it hot. Heat setting varies depending on your stove, burner and pans — different pans and stoves heat differently, Daniele said. Add 2 to 4 ounces of pine nuts to taste depending on how many you want, he said. Stir and lightly toast pine nuts to evenly brown in a dry pan. Once the pine nuts are browned, add olive oil, garlic to taste, fresh mushrooms, salt, pepper and crushed red pepper, Daniele said. Saute quickly. Adjust seasonings to taste. The pine nuts will continue cooking, don’t let them burn. Top with greens — whatever or any greens you may have, mixed greens, mesclun mix, spinach, he said. Add water and simmer to cool so the mixture doesn’t burn or overcook. By adding the greens first and then water, it stops water from splashing out. Be careful when adding water into hot oil. Toss the bruschetta mixture together depending on if you want it to be looser or tighter with water. Let simmer. Toast leftover or fresh bread in the oven. Lay the sauteed mixture over bread and serve, Daniele said. Serve on a big platter, which can typically hold 4-5 big pieces of Italian toasted bread. Do you have a recipe you’d like to share with the Sun-Gazette? To submit a recipe for Recipe of the Month, email your favorite recipe, including your name, city, a complete list of ingredients and instructions to life@sungazette.com, chay den@sungazette.com or mail the recipe to the Lifestyle Department, Williamsport Sun-Gazette, 252 W. Fourth St., Williamsport, PA 17701.